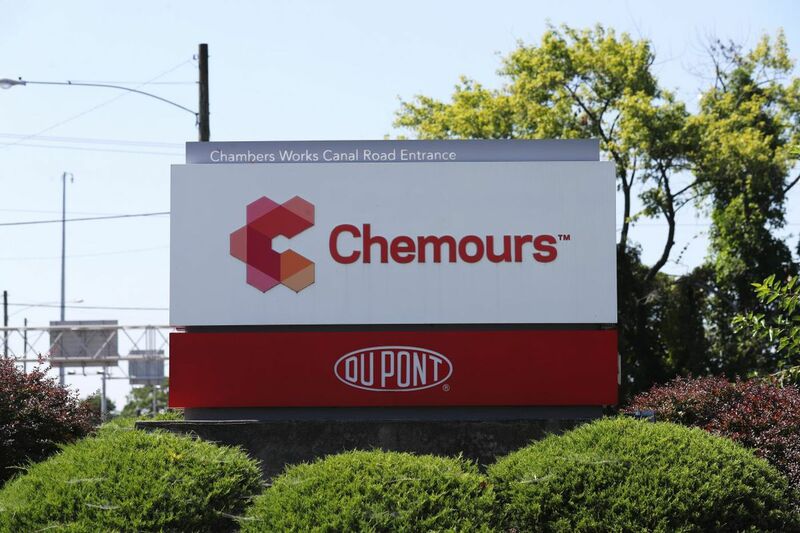 Chemours, a group of older chemical businesses, was spun off by DuPont Co. before its recent merger with Dow Chemical Co. Shown is the entrance to Chemours’ operation at DuPont’s Chambers Works in Salem County, N.J. The company also has offices in Wilmington. Chemours, the Wilmington-based company that operates DuPont's former Teflon, mining cyanide, refrigerants and titanium dioxide businesses, among others, says it plans to move its research-and-development operations from the DuPont Experimental Station outside Wilmington and other ex-DuPont sites to a new $150 million building, at the former Chrysler factory site at the University of Delaware in Newark. The glass-walled, 312,000-square-foot building will house 330 staff members, including research scientists and technicians, spokeswoman Alvenia Scarborough told me. Chemours plans to break ground in December. Delaware Gov. John Carney and other elected officials cheered Chemours' move. The company has so far announced no initial state or local government subsidies for the project, which is to be completed in 2020. In a statement, Chemours CEO Mark Vergnano called the building a "state-of-the-art innovation center" supporting a "talent development pipeline" to the University of Delaware. UD is an independent, partly state-supported school, a status similar to that of Penn State, Temple, Lincoln and University of Pittsburgh in Pennsylvania. Its strongest programs include chemical engineering, accounting, and art and music, each of which was traditionally supported by leaders of DuPont or by members of the du Pont family. Vergnano's presdecessor, Patrick Harker, the former Wharton School dean who now heads the Federal Reserve Bank of Philadelphia, purchased the ex-Chrysler site for the school after the sprawling factory closed in 2008 and christened it "STAR Campus," for Science, Technology and Applied Research. Trustees had talked about adding a law school, even a medical school, and UD has moved some of its nursing programs and a cybersecurity program to new buildings at the location, including some constructed by Wilmington developer Ernie Delle Donne. But under pressure from Delaware elected officials, part of STAR Campus was pressed into service as an industrial park. A plan to build a massive gas generator and data center was defeated by resident and faculty opposition. Bloom Energy's "fuel cell" plant, despite subsidies of more than $100 million to date from Delaware electric-power consumers, has failed to create the expected jobs. By locating at the campus, Chemours will cement its role as one of the top employers of recent UD grads. Its headquarters has remained in Wilmington's DuPont Building after the downsized DuPont Co. moved to the suburbs. DuPont has formed a partnership with the state and UD to manage the Experimental Station as the company has cut back its central research operation and Chemours and other DuPont spin-offs have pulled out of the lab center.